This scenic point-to-point ride starts in Santa Barbara and leads along the coast to San Clemente. Except for a minor climb in Palos Verdes and rolling hills in Santa Barbara, Malibu, and Laguna Beach, the course is mainly flat. After leaving Santa Barbara the route passes through Montecito, Summerland, Carpinteria, and Ventura. In Oxnard the ride leaves the coast and leads through the rich farmland of the Oxnard Plain, before rejoining the coast at Point Mugu. 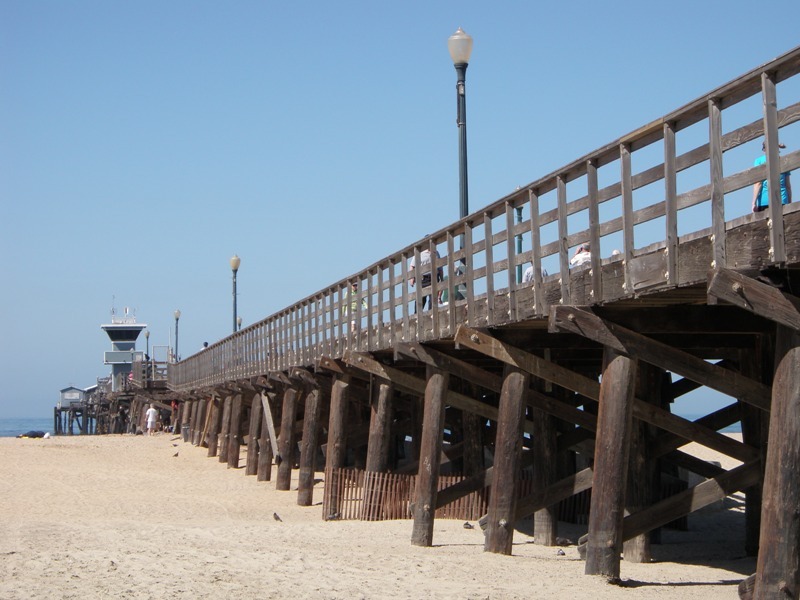 This detour avoids the urban Pacific Coast Bicycle Route, which leads through Port Hueneme. The route then continues on Pacific Coast Highway, passing through Malibu and leading into Santa Monica. Here it follows South Bay bike trail, visiting Venice Beach, Marina Del Rey, El Segundo, Manhattan Beach, Hermosa Beach, and Redondo Beach. This section of about 20 miles is slow since the trail is shared with pedestrians, rollerbladers, skateboarders, etc. In Palos Verdes the ride continues on the road and leaves the coast to lead up into Rolling Hills. 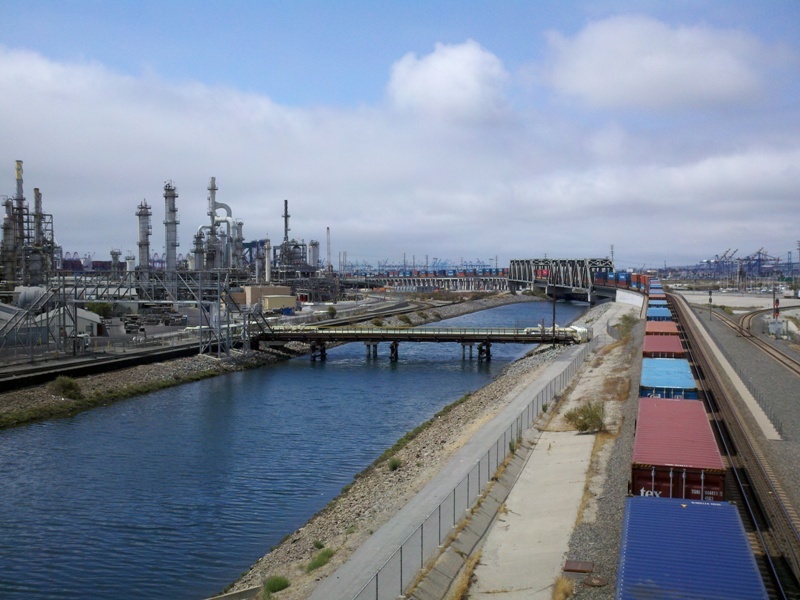 The next section from Wilmington to the Los Angeles River bike trail is industrial with heavy traffic. In Long Beach the route rejoins the coast and continues on through Seal Beach, Sunset Beach, Huntington Beach, Newport Beach, Corona Del Mar, Laguna Beach, Dana Point, and San Juan Capistrano, to finish in San Clemente. Bob N., John L., Johnny U., and I went for this ride. On Saturday we took the Amtrak Surfliner to Santa Barbara, and on Sunday we shipped our belongings and rode back home. 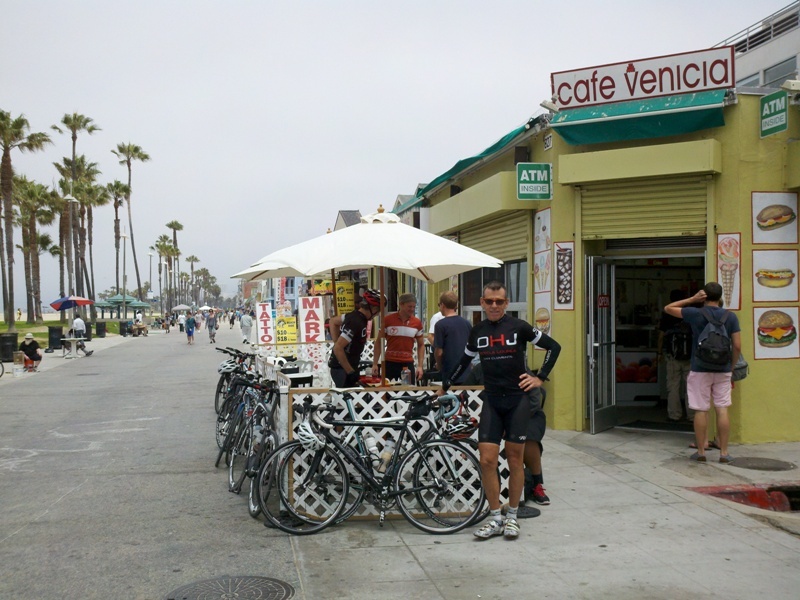 We stopped in Oxnard (Starbucks), Venice Beach (Cafe Venicia), and Seal Beach (Bogart's Coffee House). During the first few hours we encountered a wind from different directions, including an hour of strong headwind. Once the marine layer cleared, we had the typical crosswind/tailwind. For most of the ride we took five minute pulls each. Kudos to Bob, John, and Johnny for finishing their longest ride to date at an average moving speed of 17.7 mph over 179 miles. Bob N., John L., Johnny U., Peter McD., and I went for our second trip. This year we took the train on Sunday and rode home on Monday. Riding on Monday was a good idea because there was a lot less traffic on South Bay bike trail. Peter's wife Deirdre was so kind to take our belongings back in her car. Kudos to everyone for a strong ride, especially to Peter who never rode this far before. Our average moving speed was 18.4 mph over 167 miles. The course was a bit shorter than last year because we started in downtown Santa Barbara and took the urban route through Port Hueneme. Bob N., John L., Johnny U., Peter McD., Jean C., Richard S., and I went for our third annual Santa Barbara to San Clemente ride. Carlos V. joined us in Venice Beach. Peter's wife Deirdre was so kind to take our belongings back in her car. Thanks to Johnny and Susen for sponsoring the post-ride party at Downhill Johnny's Bicycle Lounge. Kudos to everyone for a strong ride, especially to Jean who never rode this far before. Our average moving speed was 16.9 mph over 165 miles. This year the route was shorter because we started in Carpinteria. Since we rode on Sunday, we avoided South Bay bike trail and took the main road. To make up for the shorter distance, we followed the coastline around Palos Verdes peninsula. Bob Y., Scott and Rita G., and I started in Los Angeles and joined the Santa Barbara group of eight in Venice Beach (John L., Peter McD., Jean C., Richard S., Don B., Matt O'M., Peter A., and Scott K.). Johnny U. and Susen S. also met us in Venice Beach, and Carlos V. and Michelle R. in Long Beach, both riding their tandems. 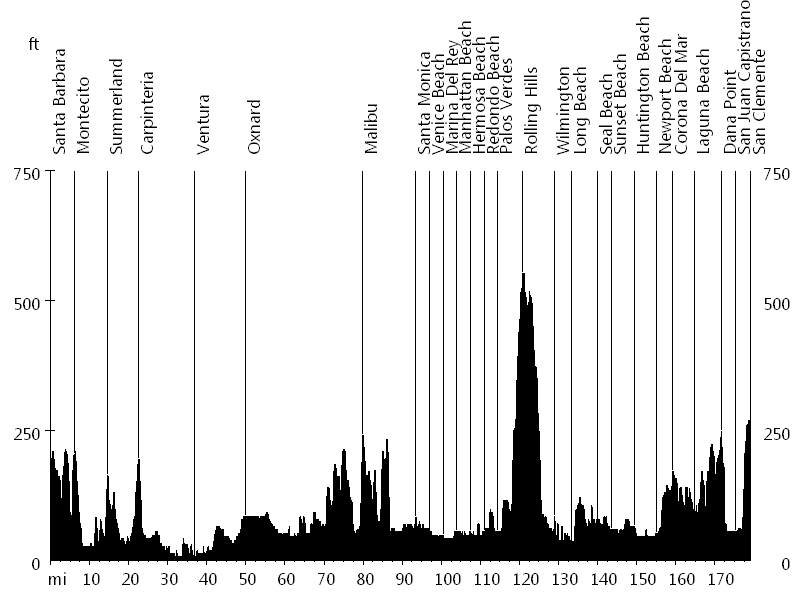 The L.A. ride is 94 miles with 2,700 feet of climbing. 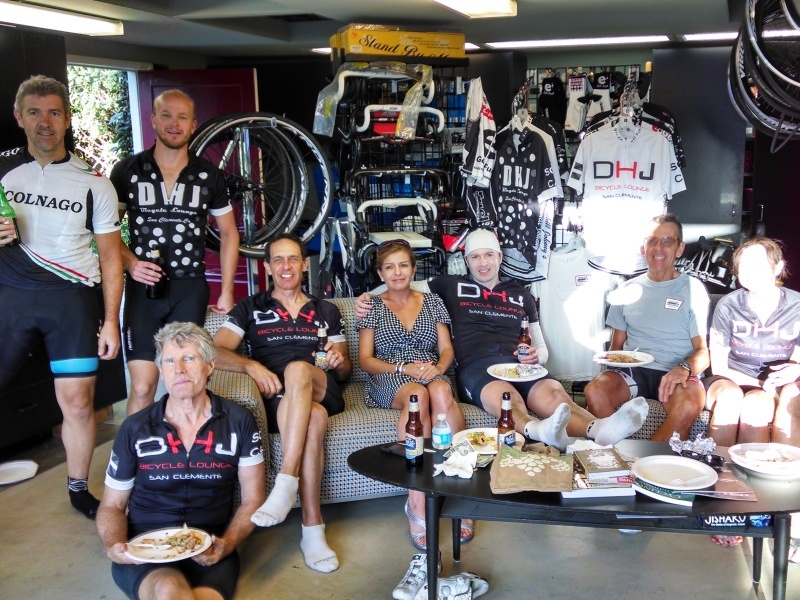 Kudos to everyone and thanks to Downhill Johnny's Bicycle Lounge for sponsoring the post-ride party.